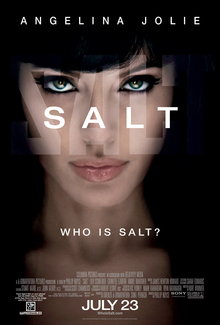 Considering recent world events involving Russian spies caught living on American soil, a couple of months back, the timing of Salt's release couldn't have been better nor more ironic. Angelina Jolie plays Evelyn Salt, who is accused of being a KGB Sleeper Agent, and goes on the run to try to clear her name. Well sort of. Salt follows similar routes with like-minded plots seen in films such as the action-packed Bourne trilogy and Tom Cruise's ridiculously over the top, yet highly entertaining, Mission:Impossible films. Surprisingly the film isn't nearly as awful as I was initially expecting, and the action sequences actually being fairly well thought out, however it's a shame Salt stumbles a few times from some absolutely absurd storytelling, which is just too convoluted for words. Whereas the Bourne trilogy unravels a mystery over the course of three films, Salt is perhaps guilty at times for revealing too much too quickly to make even the calmest of heads think, "WTF?" Despite her, rather irksome, off-screen exposure in various gossip magazines around the world, it is easy to forget Angelina Joile is actually a pretty decent actress. Though I'm never quite sure whether to applaud or simply denounce her persistence of pursuing these action heavy roles. Despite her Oscar glories in beautifully crafted cinematic dramas she seems to get a kick from making films such as the utterly terrible Tomb Raider movies, the silly yet playful Mr and Mrs Smith and the woeful adaptation of the Mark Millar's graphic novel, Wanted. Perhaps she just likes these types of roles where her characters are one woman war machines who seemingly can't be killed by conventional weapons. In Salt she fails to expand on these recurring character traits and does the exact same thing we've seen her do in the aforementioned films. No wonder Tom Cruise turned down the role because it's literally Ethan Hunt crossed with Jason Bourne. The supporting turns from the gloriously underrated Liev Schreiber and Chiwetel Ejiofor were much more compelling than the grey soulless 'US government villains' in pretty much every other action film seen in the cinemas this summer, from The Losers, to The A-Team and rounding it off with The Expendables. One of the main issues with Salt however is it's perhaps 25 years too late to be truly relevant in correspondence to world events. Did no one tell the writers the Cold War is over? Those 'Soviet Russians' might have looked effortless evil, when placed, in Sean Connery era James Bond films but just doesn't strike the same type of chord with modern day audiences. Salt is without a doubt the best of Jolie's ventures into the action movie genre and if a proposed sequel is indeed in the works, I could frankly think of worse ways to spend my money in the cinema. The set pieces are delightfully over the top, typically defying logic yet still loads of fun to witness on the big screen. As for the plot? Well best take that with a pinch of...No. Too easy. The Bourne Trilogy, Mission:Impossible, Wanted. Salt is in cinemas everywhere now. I also loved seeing a female action role - There should be more "tough" female role models like this! The Russian spies, however? Wow. A major rehash of the usual sterotype. I agree wholeheartedly with your review! And I'm glad I'm not the only one who found sudden revelations a bit "Where was the build up to this?". Definitely one of the more entertaining films I've watched recently.